The Department of Children and Families, which will house 85 case workers and serve as DCF’s regional headquarters. The mission of DCF is to ensure that children are able to grow and thrive in a nurturing home environment through case management, foster care, and adoption services. The project will open in the spring of 2020 and at full occupancy will bring over 400 new jobs to the Jackson Square area. 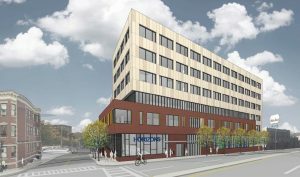 Affirmative secured $47.7MM of NMTC Allocation from MassDevelopment, Massachusetts Housing Investment Corporation, The Community Builders, Partners for the Common Good, The Rose Urban Green Fund, and Building America. Affirmative also secured debt financing for the project from Eastern Bank, Boston Private Bank, BlueHub Community Capital, and The Life Initiative.